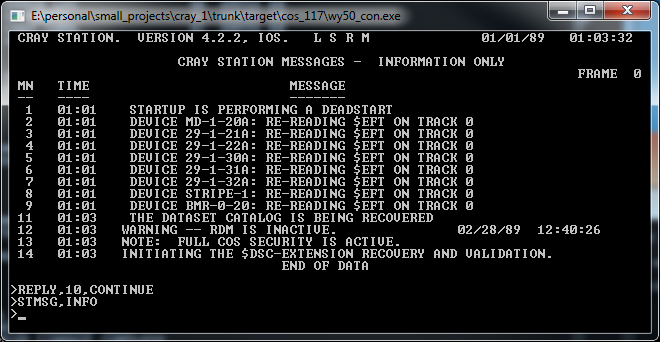 With the last set of changes, I can boot the full COS operating system. Download the updated image (version 0.82) from the download page. 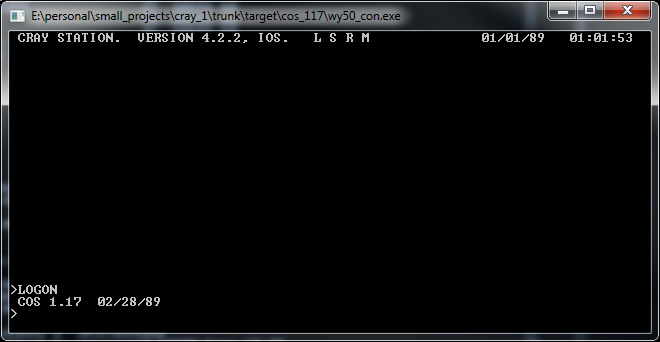 Then open a command prompt, and type cray_xmp_sim xmp_sim.cfg in the ‘bin’ directory. This will start the simulator. The STMSG command asks you about configuration changes, just as before, simply reply with go (REPLY,0,GO). Next, you’re asked about the missing label on the BMR-0-20 drive. This is a RAM-disk drive, which of course doesn’t preserve it’s content between boots. 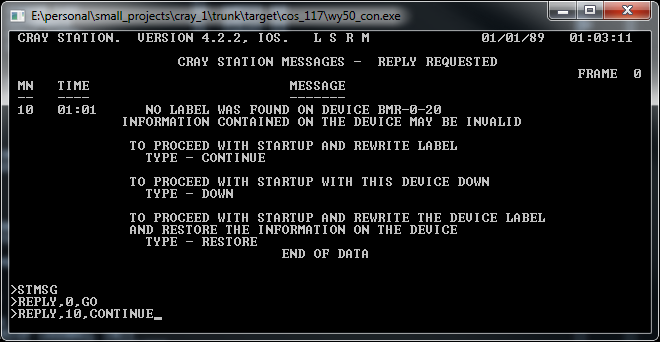 According to the COS Operational Procedures Reference Manual, this message is displayed unless the *RESTORE directive is present in the parameter. File. I’m not sure why the OS assumes a volatile device would preserve it’s content between boots. 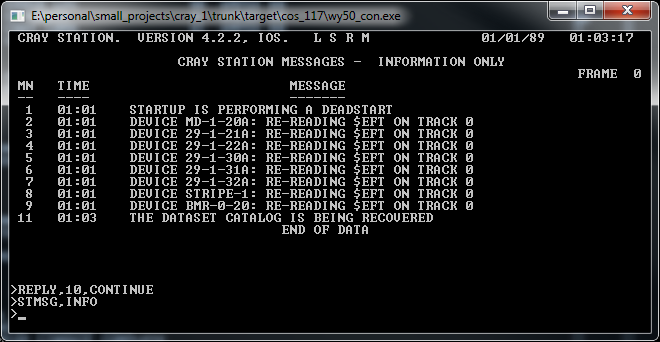 Maybe this is just a safety feature to prevent accidental automatic re-writes of the disk label during warm-boots. 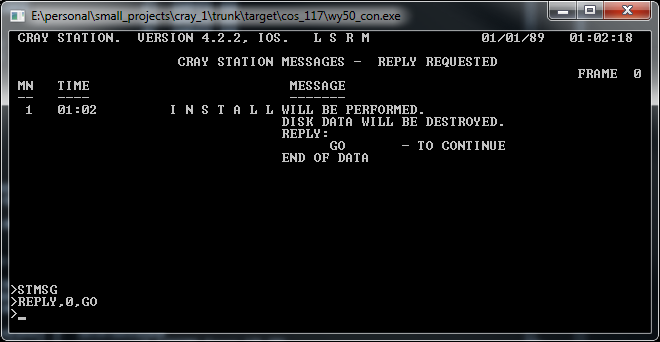 At any rate, type in REPLY,10,CONTINUE to re-write the disk label to this RAM-disk. This particular machine had a MOS memory (SRAM I would think) for RAM-disks. 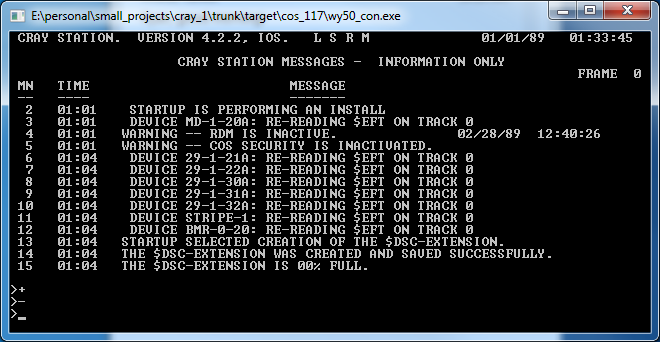 It also had an SSD option that I don’t know much about, that might have been persistent. WOW! Brilliant work: from deducing the manchester encoding on the raw magnetic photographs to coding the main & I/O CPUs. In the 70’s all I could do was make my own 8080 (2K Ram) based computer. I also aquired some old ICL EDS 8 hard drives and got them to work with my little “toy”. 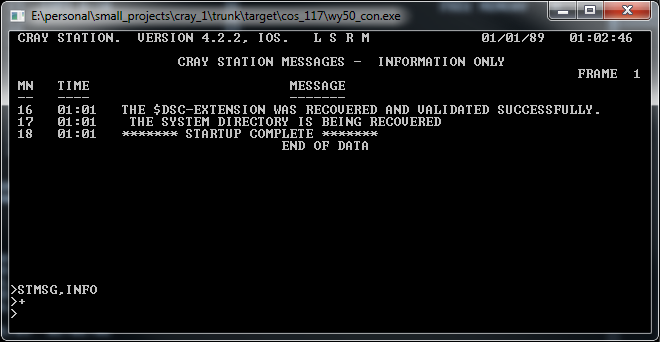 I could only dream about the likes of Cray and the other big iron stuff. You have allowed me to experience the type of system I was dreaming about: without the large power and maintenance bills! Thank you! As a programmer, I appreciate what you’ve done and the huge amount of work it must have taken. The modern stuff takes out all the romance and “hands on” understanding you had to have to operate those beasts. I can write source that will compile on Linux, Win32/64 & Android and not have any concern about the hardware. How things have changed. SRAM usually persists for quite some time after the power is out. In other words, chances are that an SRAM disk would retain it’s state for minutes, possibly longer. 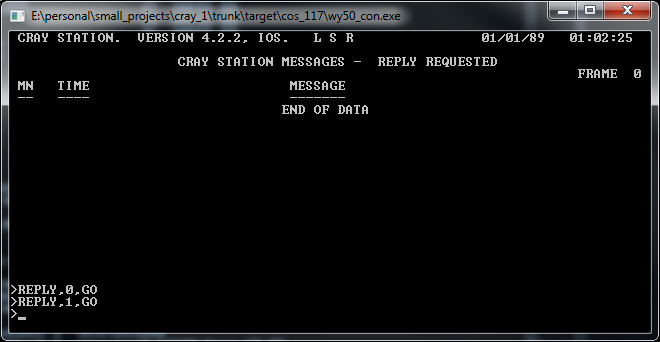 Now it’s just waiting for someone to program Craysis…. 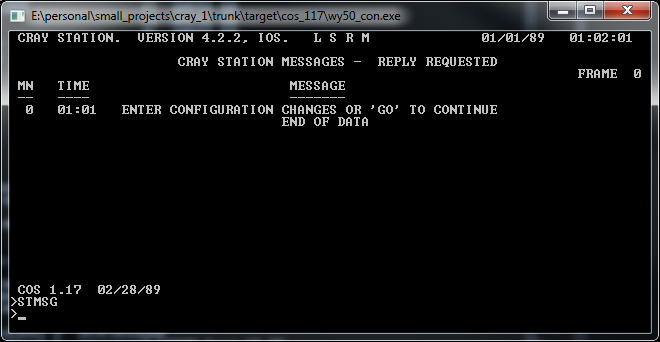 Workbook for CRAY-1S with IOP and STATION commands and their description. They work on your emulator too. 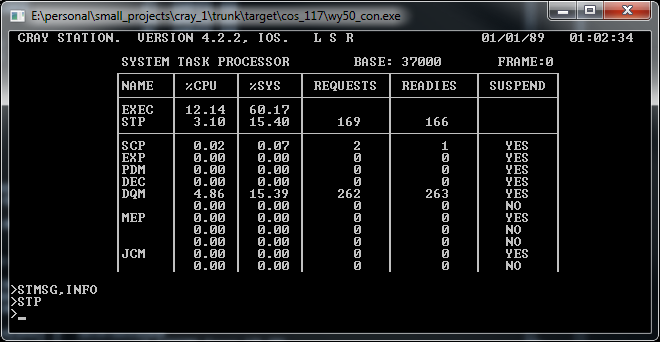 Detailed one is T0201D… in the same dir. 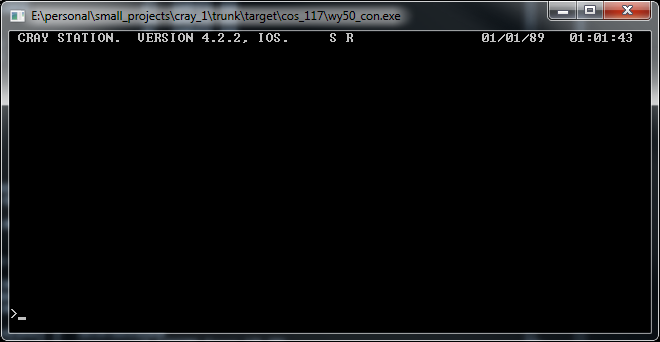 Ive successfully run and installed the cos under linux wine. Did notice the simulator called out for MPCAP or something similar. Are you planning on networking the simulator one day? 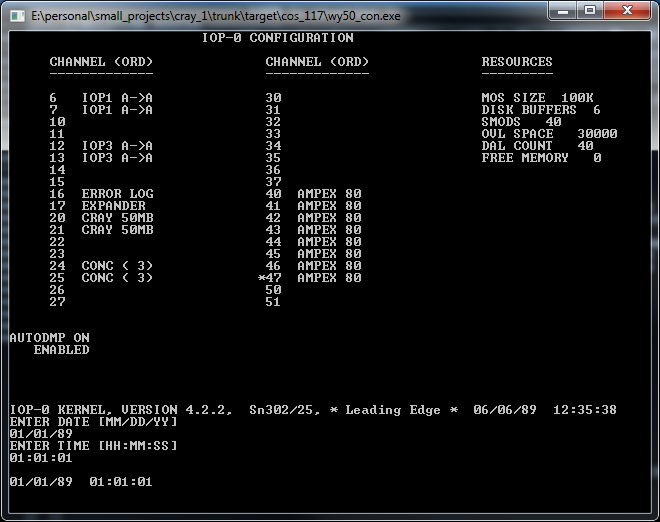 Would love to see native simulator on linux or other unix. 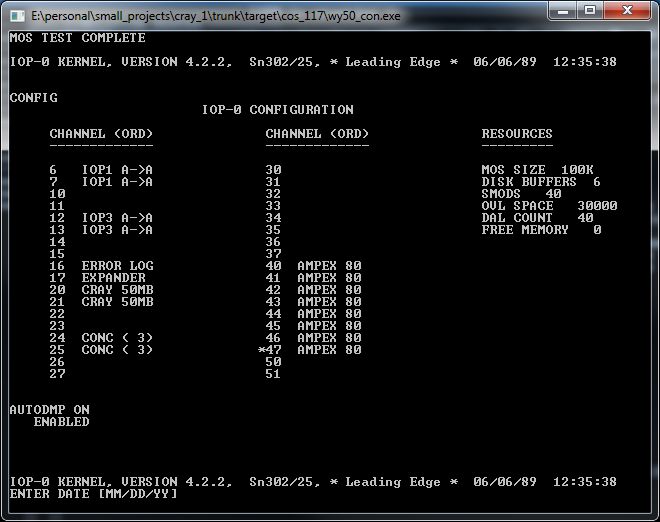 The simulator uses TCP/IP to communicate with the consoles. That’s all the networking in there. In theory the ‘FrontEnd interface’ was what you would call these days the network, but the protocol was very complex, so writing a client would be a lot of work. As far as Linux support goes, I’m working on it. It was always my intent that the code would work under it, but along the way something got borken. At the moment (the the release version, but what I have locally) compiles just fine, but doesn’t run properly under any GCC-based environment. I don’t know yet why, but once I’ve figured it out I’ll post a new release. This software is not working on Windows XP (32bit) !. All exe files are producing error “is not a valid Win32 application”. True, I didn’t know about this issue. Thanks for bringing it to my attention. I’ll fix this in the next release. 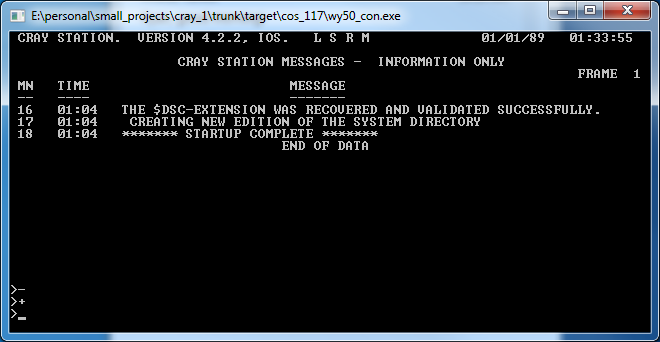 In the meantime, you can re-compile locally, just change the ‘platform toolset’ to v110_xp. See http://blogs.msdn.com/b/vcblog/archive/2012/10/08/10357555.aspx for details. Interesting. COS_117_1 has a newer creation date. June instead of February. The creation dates on these files are totally arbitrary and set when you create the extender disk image using exp_disk_create. In fact it doesn’t even have to be a date, it’s just two 8-char long strings. I’m not sure why it would be different though then the rest. Oh, I was referring to the date given after LOGON. COS_117_1 was assembled in June, apparently versus COS_117 which was assembled in February. After a few minor problems with compilation under Linux (Kali 1.0.9) I managed to get the CONSOLE software running in the emulator and the COS INSTALL running in the CON. 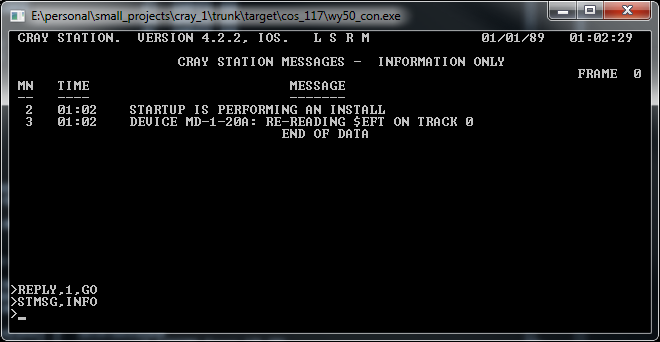 After a while however, the INSTALL process crasches the emulator. After installing boost libraries before I successfully managed to compile the software. (The GCC version used is 4.7.2 and BOOST version is 1.49) This I specified in the ‘common.mak’ -file before the emulator compiled successfully. The Linux environment runs natively on the computer (a Panasonic CF-19 Toughbook with 4 GB of RAM). No virtual environment like WMWare. Is it correct that there should be this many disk dumps? 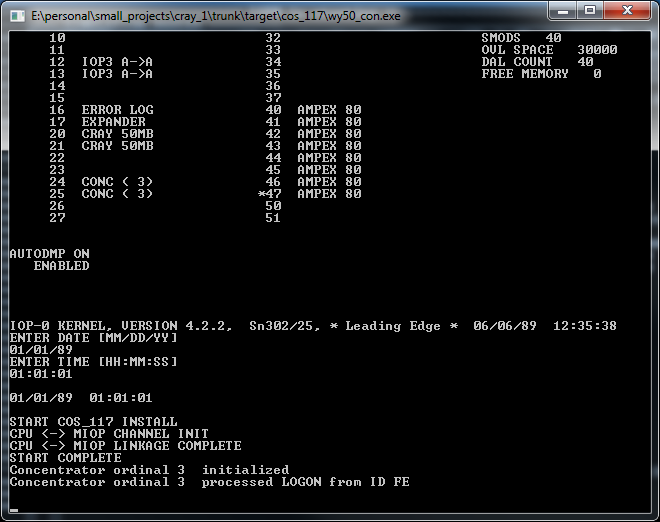 (I have seen these also while the emulator is still running.) I used to delete the oldest intstances to see if the emulator survives but no matter what I do so far, the COS crashes after a while. I hope this helps, and thanks again for the feedback!